Provide comfort for the family of Lacy Eastman with a meaningful gesture of sympathy. 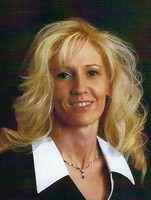 Lacy Eastman, age 41, was born in Provo, Utah to James Eastman and Pamela Canfield Eastman. In her early years she loved to sing and dance. She enjoyed her butterfly garden watching butterflies and hummingbirds. She loved collecting Care Bears and especially adored the ones painted for her by her Grandma Carol. Lacy enjoyed spending time remodeling and decorating her home and customizing her Yukon with her step-dad Johnny. She was a wonderful mother and loved being a mother above all. She was very proud of her children, they were the world to her and she loved spending time with them. She also enjoyed four-wheeling and camping with Adam and the kids. Lacy loved learning and was on the 1992 Honor Roll with a 4.0 GPA and graduated high school through Nebo School District. She attended UVU studying Early Child Care Development and courses in computer science. Lacy is survived by the love of her life Adam Hardy, her mother Pamela Eastman Goode, step-father Johnny Goode, father James Eastman, children Megan and Ashtin, step-daughter Aleesa Hardy and grandmother Carol Canfield. She was preceded in death by her grandfather Donald Canfield, sister Rashelle (Shelly) Morrison and step-dad Robert (Bob) Wood. A viewing will be held Friday April 19th from 9:00 to 10:15 a.m. followed by funeral services at 10:30 a.m. at the LDS church located at 2225 West 620 North, Provo, Utah. Burial will be in the Payson City Cemetery located at 400 North 800 East, Payson, Utah. The family would like to thank everyone at the Legacy Funeral Home and a special thanks to Bishop Hansen and members of the LDS Lakeside 7th Ward for their compassion and service. To send flowers in memory of Lacy Jean Eastman, please visit our Heartfelt Sympathies Store. We encourage you to share your most beloved memories of Lacy here, so that the family and other loved ones can always see it. You can upload cherished photographs, or share your favorite stories, and can even comment on those shared by others. Provide comfort for the family of Lacy Jean Eastman by sending flowers. Heartfelt Sympathies Store purchased flowers for the family of Lacy Eastman.